Season one of Dana White’s Tuesday Night Contender Series gave rise to a new avenue for up and comers to make it on to the ultimate proving ground. In today’s episode of Across The Pond, you will meet two alums from the first season looking to take the next step on their respective UFC journeys. A professional since August 2014 and representing Team Alpha Male, Benito Lopez owns a 9-0 record consisting of four decisions, three knockouts and two submissions. Lopez earned a UFC contract on week seven of season one of Dana White’s Tuesday Night Contender Series. Prior to making his UFC debut in 2017, Lopez competed for Bellator MMA, King of the Cage and West Coast Fighting Championship. In his MMA debut at Bellator 115, Lopez defeated Oscar Ramirez via unanimous decision. Next, he defeated Dray Mitchell via unanimous decision at WFC 11. Lopez submitted his next two opponents in Stephone Taylor and Matt Wagy. At King of the Cage Home Turf, Lopez knocked out Rick James in the first round. He also defeated Journey Newson and Benjamin Vinson. 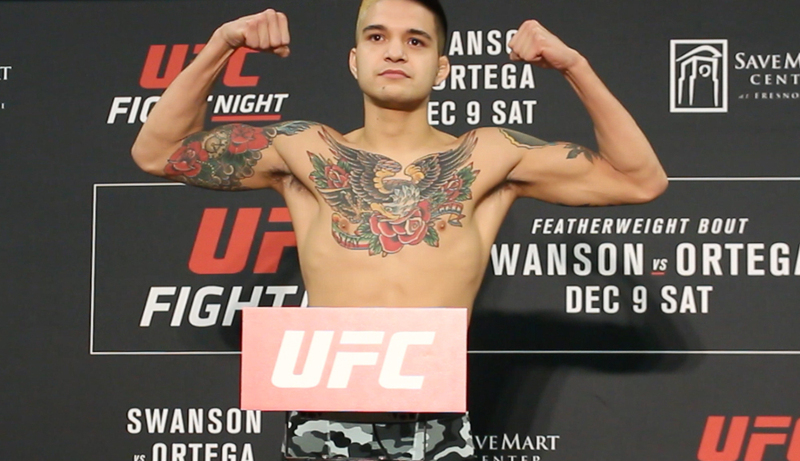 At Dana White’s Tuesday Night Contender Series 7, Lopez defeated Steven Peterson via split decision and punched his ticket to the UFC in the process. In his UFC debut at UFN 123, he defeated Albert Morales via unanimous decision. A professional since March 2015 and representing The MMA Lab under head coach John Crouch, Sean O’ Malley owns a 9-0 record consisting of six knockouts, two decisions and one submission. O’ Malley earned a UFC contract in week two of season one of Dana White’s Tuesday Night Contender Series. In his MMA debut, O’ Malley defeated Josh Reyes via TKO in the first round. Then, he knocked out Shane Sargent in the first round. O’ Malley submitted Omar Avelar in the first round via rear naked choke at ICF 20. At Intense Championship Fighting Fight Night, he defeated Mark Coates via unanimous decision. O’ Malley knocked out his next two opponents in Irvin Veloz and Tycen Lynn. In his lone LFA appearance at LFA 11, he knocked out David Nuzzo in the first round. At Dana White’s Tuesday Night Contender Series 2 O’ Malley knocked out Alfred Khashakyan in the first round and punched his ticket in the process. In the co-main event of The Ultimate Fighter season 26 finale, O’ Malley defeated Terrion Ware via unanimous decision. At UFC 222 on March 3, he will face off with Andre Soukhamathath in a bantamweight showdown. Good luck Sean! Analysis- I think that both Lopez and O’ Malley are solid prospects that the UFC can slowly build up. At just 23 years of age, both gentlemen possess equally dangerous skill sets and showed tremendous promise in their respective UFC debuts. Lopez and O’ Malley come from well-respected gyms and I expect their arsenals to grow with more UFC outings under their belts. The bantamweight division is definitely talent-rich at the moment so it will be interesting to see how the UFC markets these two golden boys going forward!